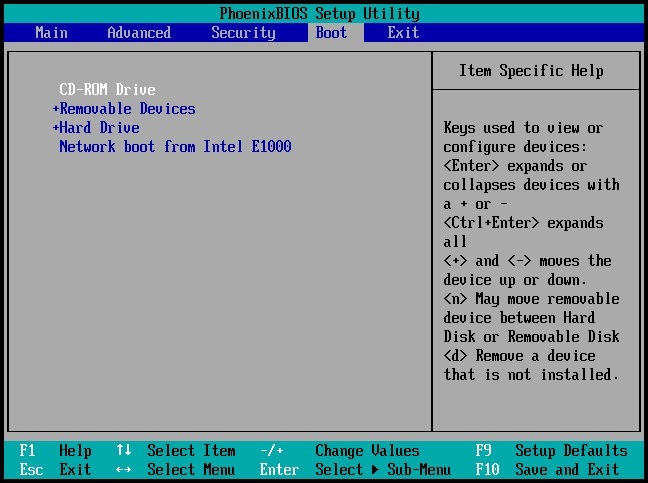 To arrange boot order in BIOS so can boot from desired location/media/disk you setup Bios temp or permanently so the desired is the first booting device e.g. DVD (1) > USB stick/Disk (2) > HDD (3) … meaning boot from DVD if you have bootable CD or DVD, (if not) boot from USB if you have Bootable USB Stick or USB HDD… etc. 1. If you use a USB flash drive as a bootable media, plug it into the USB port. 2. Turn your computer on. During the Power-On Self Test (POST), you will see the key combination that you need to press in order to enter BIOS. 3. Press the key combination (such as, Del, F1, Ctrl+Alt+Esc, Ctrl+Esc, in my PC is F10). BIOS setup utility will open. Note that BIOS may differ in appearance, sets of items, names, etc. Some motherboards have a so called boot menu opened by pressing a certain key or key combination, for instance, F12. The boot menu allows selecting the boot device from a list of bootable devices without changing the BIOS setup [in my PC this is F9]. 4. If you use a CD or DVD as a bootable media, insert it in the CD or DVD drive. 1. Navigate to the Boot order setting by using the arrow keys on your keyboard. 2. Place the pointer on the device of your bootable media and make it the first item in the list. You can usually use the Plus Sign and the Minus Sign keys to change the order. 6. Exit BIOS and save the changes that you made. The computer will boot from bootable media if present. If the computer fails to boot from the first device, it tries to boot from the second device in the list, and so on. Some PCs have UEFI instead of BIOS.